Two presidents. One Democrat, one Republican. Both turn ninety this year. Neither man ever directly ran against the other. But how do Jimmy “Peanut farmer” Carter or George “Read my lips” Bush square up in a direct face off? 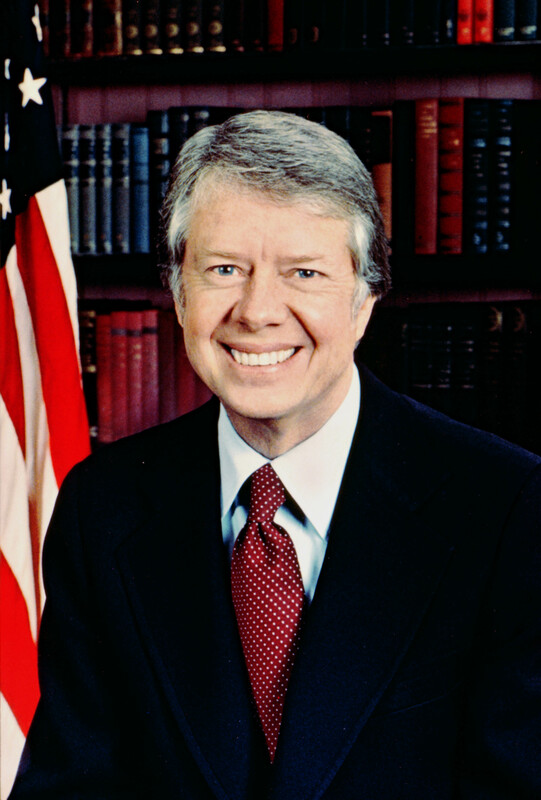 Carter: The younger of the two, James Earle (“Jimmy”) Carter was the 39th president between 1977 and 1981. He has been a former president for thirty three years, longer than any one else in US history. 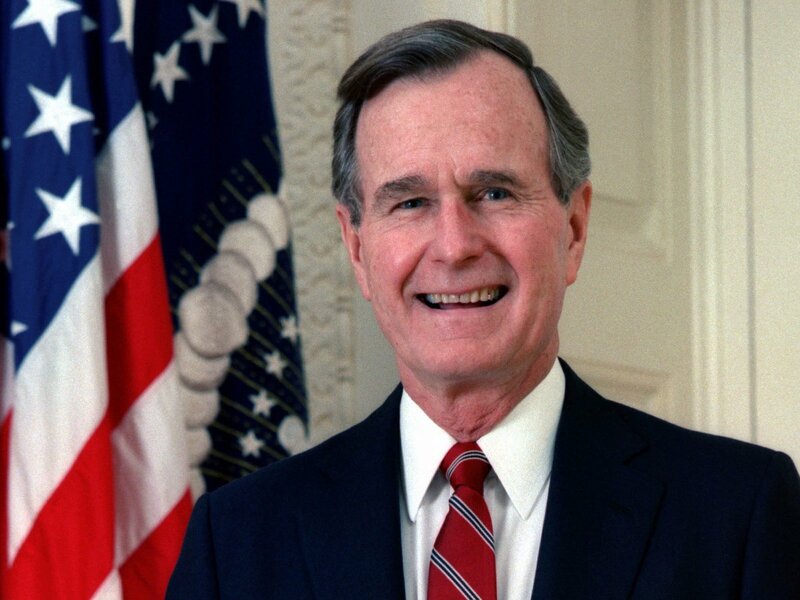 Bush: George Herbert Walker Bush was the 41st president from 1989 until 1993. Only the second man to be both president and father to a US president (the other was John Adams) he was always referred to as simply “George Bush” before 2000 but is now usually referred to as George HW Bush to distinguish him from his son George W Bush (43, 2001-2009). Carter: Famously a Georgia peanut farmer, Carter also has a first class degree in nuclear physics and served in the navy in World War II. Bush: Scion of a super rich Texas oil family, Bush was the youngest ever US pilot in World War II. His father was a Republican senator. Carter: Carter served as a Senator and as Governor of Georgia. Bush: Bush took a different route becoming a congressman and twice standing unsuccessfully for the Senate in the Sixties, only really coming to the fore as Ambassador to the UN and head of the CIA under Nixon and Ford. He was sacked by the new president, Carter in 1976 but sought the presidency himself in 1980. He was beaten for the nomination by Ronald Reagan who picked him as his running mate. Bush served two terms as Vice President between 1981 and 1989. Carter: Carter triumphed over California Governor Jerry Brown and his eventual running mate Walter Mondale. Bush: As Veep, Bush was always the favourite for the 1988 Republican nomination beating eccentric evangelist Pat Robertson (Rupert Murdoch’s preferred candidate) and Senator Bob Dole who came to be seen as a sore loser after he angrily called on Bush to “quit lying about my record”. Carter: In 1976, Jimmy Carter narrowly beat President Gerald Ford. Weakened by Watergate, recession, the Nixon pardon and a gaffe in which he denied Eastern Europe was dominated by the USSR in the TV debate, Ford was only the third president to be beaten in a November election in the 20th century (after President William Taft lost to challenger Woodrow Wilson in 1912 and incumbent Herbert Hoover who lost to FDR in 1932). Bush: Initially perceived as a “wimp” from a privileged background, Bush trailed his opponent Governor Michael Dukakis during the summer of 1988. Fighting a dirty campaign and lambasting Dukakis as a “tax and spend liberal,” Bush reversed the situation, helped by Dukakis’s refusal to respond to Bush’s attacks, Dukakis’s unpopular opposition to the death penalty, Bush’s “Read my lips, no new taxes” pledge and Dukakis’s short physical stature. Bush ultimately won a forty state landslide and ultimately beat “Duke” by around an 8% margin in the share of the vote. Carter: Walter Mondale served as Carter’s Vice President. He performed less well as Reagan’s presidential opponent in 1984 winning only one out of the fifty states contested (Minnesota). Bush: Bush’s choice Dan Quayle was a gaffe-prone disaster who quickly became a national joke. Quayle was exposed as a Vietnam draft dodger (using his family connections to secure enrolment on the Indiana National Guard), misspelled the word “potatoes” in public, botched a tribute to the Holocaust (claiming it was a sad chapter “in our nation’s history”) and attacked TV sitcom Murphy Brown after the main character had a child out of wedlock. Nevertheless, Bush retained him as running mate even in 1992. Carter: Although he was never hugely popular, carter achieved a major breakthrough in the quest for Middle East peace with the signing of the Camp David Agreement in 1978. The SALT 2 Treaty was also a huge success in Détente though it was never ratified by the US Senate. Bush: Bush achieved successes in the Middle East too but his biggest success was the 1991 “Desert Storm” victory over Iraq and Saddam Hussein. 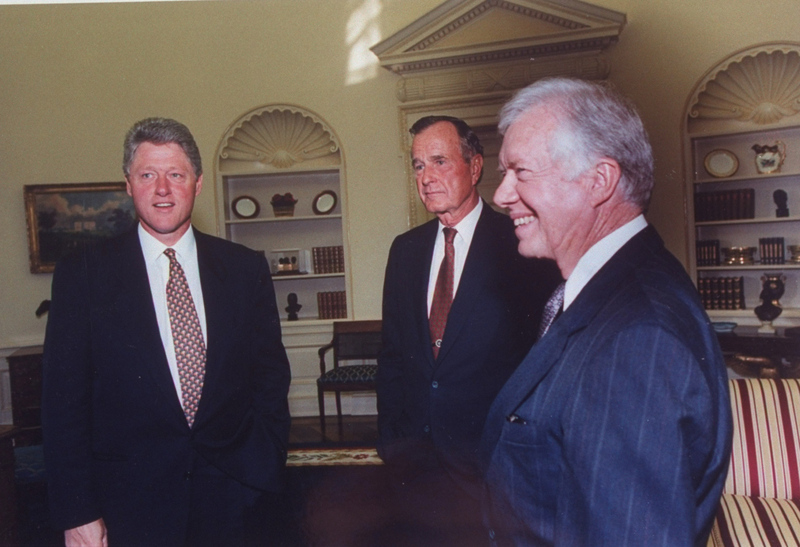 Bush became the most popular president in thirty years. Some on the Right later regretted not extending the war into Iraq itself as Bush’s son would later do with disastrous consequences. Carter: Never popular, Carter failed to get to grips with the economy, eventually attempted a disastrous move to the Right and a Reagan-like defence build up after the Soviet invasion of Afghanistan. His presidency was ultimately poisoned by the Iranian hostage crisis after 1979. The hostages were released on the day Carter left office in January 1981. Bush: Bush witnessed a spectacular collapse in popularity between 1991 and 1992, due to the recession, his apparent preoccupation with foreign affairs and his introduction of the second biggest tax increase in US history after his “no new taxes” pledge in 1988. In reality, with Reagan having left him a spiralling national debt, Bush was foolish to have ever made the pledge in the first place. Carter: In 1980, the president faced a serious internal challenge from senior Democrat Senator Ted Kennedy (brother of the assassinated Jack and Bobby). Memories of Kennedy’s role in the 1969 Chappaquiddick Incident wrecked his chances though. Bush: in 1992, Bush was distracted by a major primary challenge from ex-Nixon speechwriter Senator Pat Buchanan, a pugnacious right winger. Carter: Carter was beaten soundly by Republican Ronald Reagan in November 1980. In the run-up to the election, the contest appeared much closer than it ultimately proved. Bush: Bush faced an independent challenge from Texan billionaire H. Ross Perot, but it was ultimately Democrat Governor Bill Clinton who beat Bush, overcoming rumours of infidelity and draft dodging to become one of the most accomplished campaigners in US history. Carter: Although not a hugely successful president, Carter has been a hugely successful ex-president winning the Nobel Peace Prize, writing an acclaimed novel and appearing in Ben Affleck’s film Argo. Bush: Bush‘s legacy has perhaps been tarnished by the poor record of his son as president.